The news of Ringling Brothers and Barnum & Bailey Circus's closing in May 2017 was met with thunderous applause from animal lovers across the planet. The end of the circus means the end to more than a hundred years of animal cruelty. There is a great deal to celebrate about the closure, but there's still work to be done. The fate of the animals so many rallied to protect is still up in the air. Finding homes for dozens of animals in need is no easy feat. The company that owns Ringling Bros, Feld Entertainment, owns the majority of the animals used in their shows, including the most visible animals associated with the circus, tigers. There are also dozens of other species that present unique difficulties in rehoming. Kangaroos, llamas, camels, horses, and more all need safe homes that can address their species' specific needs. Feld Entertainment has publicly stated that they are committed to finding "suitable homes" for all the animals, but they have failed to elaborate on what constitutes a "suitable home." These animals deserve to live out their days in accredited, reputable sanctuaries. Ringling needs to commit to making sure they don't end up with private owners, other circuses, or roadside zoos. The laws for exotic animal ownership vary state by state, and there's very little federal oversight, so it's up to Feld Entertainment to do right by their circus animals. The only acceptable and "suitable" fate for these animals is for them to retire to accredited sanctuaries live out their days. After years of abuse and mistreatment, it is time for Ringling's animals to find peace. Help make sure Feld Entertainment does the right thing and protects every animal by sending every single one to an accredited sanctuaries! The closing of Ringling Brothers and Barnum & Bailey Circus is certainly the end of an era, and for many, a tragic one. While the institution may be gone, the legacy of Ringling Brothers is not, and the fate of the animals in your care will forever cement that legacy. The care and upkeep of wild animals, as you certainly know, is far from simple. Finding appropriate homes for many of the animals will be difficult. However, it is imperative that every animal under your charge is sent to a safe, accredited sanctuary that will provide them a quiet, and peaceful home to live out their days in retirement. Making sure each animal ends up in a sanctuary that can give them the best home isn't going to be easy, but the legacy of Ringling Brothers and Barnum & Bailey Circus hinges on making sure the animals that made the circus famous end up living happy and full lives in retirement instead of in the hands of private owners, other circuses, or roadside zoos. Help make sure that the circus is remembered for the right reasons. Great news! 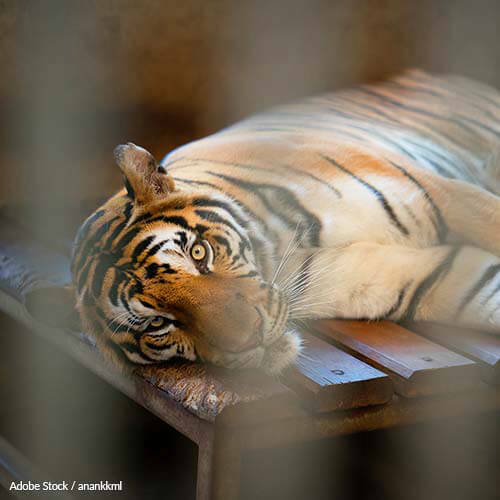 Thanks to your combined voices, Ringling's tigers have been surrendered to Tiger Haven, a big cat sanctuary in Tennessee, the Washington Post maintains. The tigers will be able to live out the rest of their lives on the 45-acre sanctuary. The facility is not open to the public and does not display its animals for entertainment. Nor does it breed them. Great work everyone!